My Higher Self REFUSED to be Fooled Today – Whats your superpower? I don’t like tricks being played on me so I tend to lie low for April Fools. My friend Sally Ann did catch me though with a Facebook post that she’d been up all night because one of her dogs made young ‘uns. I was ecstatic thinking to myself that since I no longer had Tosca and Tula (my former Dr. Jekyll/Mr. Hyde Labrador/Rottweilers), an entire OTHER story, I could take one of the pups off her. It turned out to be a joke. I’d been punked. One joke…hopefully no more for the rest of the day. I didn’t have too many conversations today but I did have a very significant one with myself. I’ve been in the rear view mirror of my life recently – reviewing how things have progressed thus far – what I could do differently – what I needed to do more of. One of the things that kept popping up was that I simply needed to have more COURAGE. Courage seems to be MY word for this leg of my journey. I want to inspire others to build their courage muscle and UN-stick from wherever they’ve been stuck – Lord knows how long. But I realize that it’s not going to happen based on ANY of my own expectations. I have no idea how long or short it will take, But I’m taking my own advice and sticking with it for at least 18 months (you’ll see how it all unfolds). Self then has a conversation with self about fitness. “You know you need to practice what you preach. Everyday for the month of April, you will take a walk after dinner.” This claim was reinforced by something I read in the ‘Poke the Box Workbook’ by Seth Godin – Is there an area of your life that needs poking? Can you make things better for you and those around you? The second suggestion had my name written all over it. I would be the leader and walk. Except right after dinner I started negotiating with myself…telling myself that I would start TOMORROW! Does this sound familiar? But my higher self refused to be conned. Up until this time I didn’t share my commitment with anyone so it was easy to change my mind and start on another day. The next thing that happened is I heard myself saying to Ana – “I was thinking about going for a walk.” Now someone else KNOWS. I then asked her if she wanted to go and she said “Yes! Let’s go now because it’s getting late.” And BOOM! We walked – down the hill and back up again. And I did…I did indeed. Thanks for ignoring me today Higher Self. You refused to be fooled today! 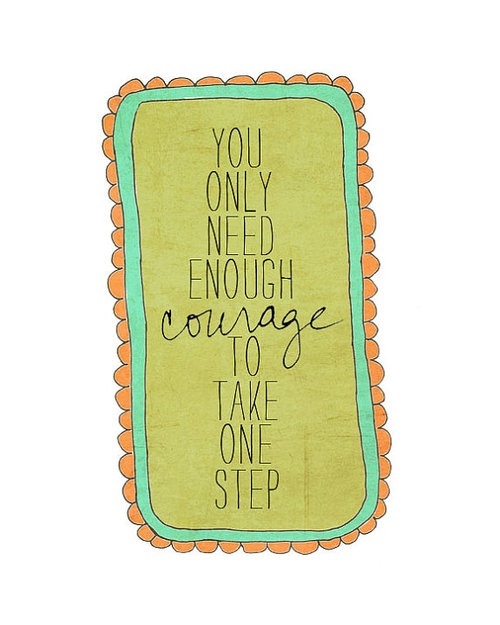 What small courageous step will you take today? Next postThe Label of “Dumb” – What Does it Mean Exactly?